I have been having a holiday weekend crisis. People keep asking what our plans are, and I have to admit we have none. Normally I would LOVE a weekend with no plans, but with high expectations of Labor Day fun, I am feeling a bit lost. So this morning, determined to muster up some holiday spirit, I decided to try a new pancake recipe. I’ve been excited to try these oatmeal blueberry yogurt pancakes from Ambitious Kitchen for a while now. So with a few adaptations based on family preferences, I came up with my version of these delicious blueberry yogurt pancakes. And while they may not be for pancake purists, my American husband proclaimed that these are the best pancakes he has ever tasted! Place the oats, vanilla yogurt, plain yogurt, banana, eggs, and vanilla extract in a mixer or nutribullet and blend until smooth. Pour mixture into a large bowl and stir in the whole wheat flour and baking powder until just combined. Heat a skillet (frying pan) over a medium-low heat with a drizzle of oil or a small amount of butter. Pour the pancake batter in ¼ cups into the heated skillet. Immediately sprinkle blueberries, chocolate chips, or your choice of topping onto the pancakes. Cook gently until bubbles start to appear on the surface. Flip the pancakes and cook the other side for about 90 seconds, or until golden brown (you can gently lift the edge with a spatula to check the color). Remove from the pan and enjoy, with or without maple syrup. « Are You Making These 5 Grocery Shopping Mistakes? 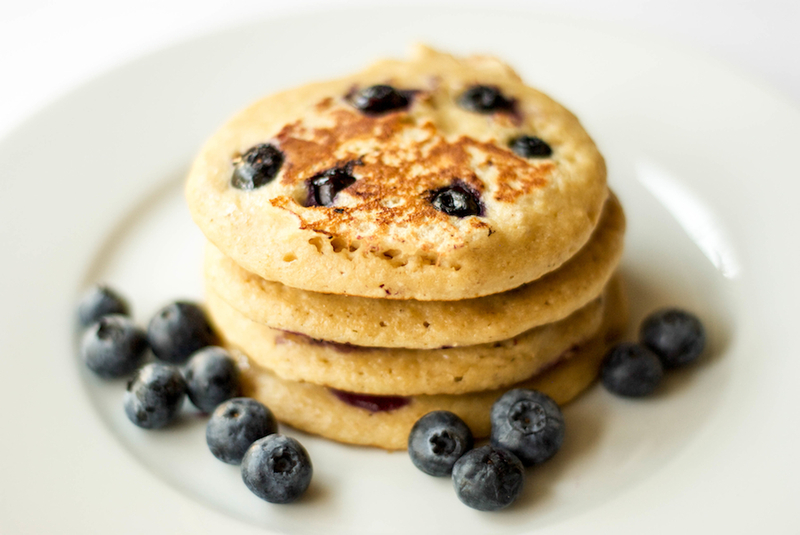 I love pancakes, they are such a delicious comfort breakfast food that really make it feel like the weekend! I love adding ricotta to mine, they always turn out so fluffy and moist from it! Those look so delicious, need to try them. I haven’t tried them with ricotta yet. That’s next on my list. Thank you. My picky toddler loved them. I hope yours does too. Thanks Kathy. And I’m looking forward to reading more from your blog too. These sound great. I love pancakes but usually try to avoid them because of the unhealthy ingredients. These are much more wholesome! I’ve never tried pancakes with yogurt in them. These look delicious, I’ll have to try them! This was the first time for me trying pancakes with yogurt. I was skeptical but they were really good.